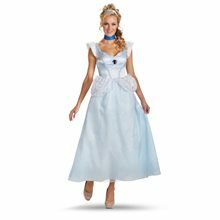 Deluxe Cinderella Child Costume.Includes: Deluxe dress with character cameo, petticoat and matching headband. 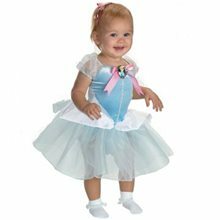 Available Size: Toddler - XSmall (3T-4T), Child - Small (4-6x), Child - Medium (7-8). (See Size Chart For More Information) *Shoes Not Included. Accessories Sold Separately. Bibbidi-bobbidi-boo! The spell has worked! But she only has until midnight and you both know it's past her bedtime, but this one time you might make an exception, because she's just too adorable to say 'no' to. 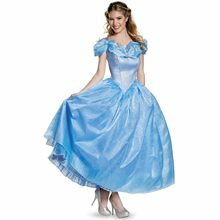 Cinderella Wig can go perfectly with your Cinderella costume. 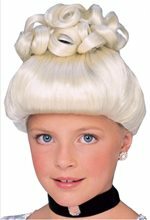 It Includes blonde wig with piled curls at crown and silver hair ribbon. Synthetic fibers, wash gently. For ages 4 and up. Don't forget a wig cap for improved fit, comfort and styling ability..It is One size.